As I noted last month ‘we’ have won re-election. That means there will be an official evening ‘gala’, not unsimilar to this one four years ago. 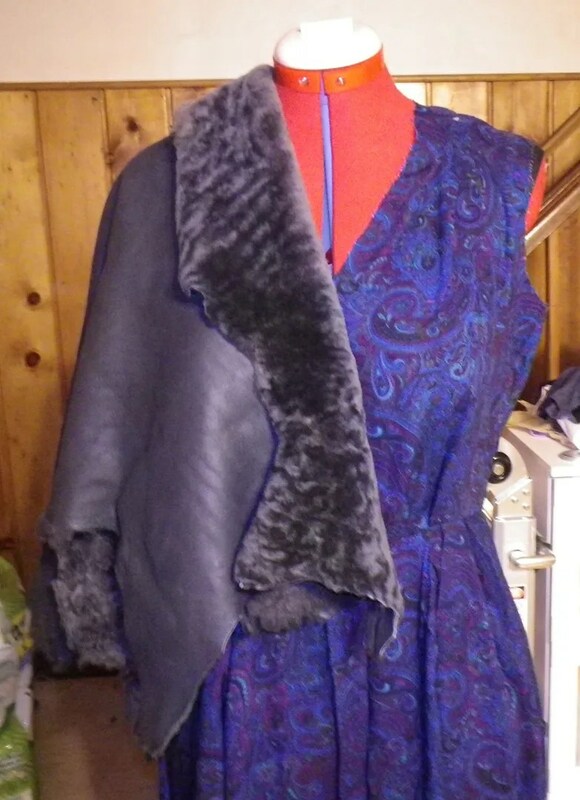 I had grandiose ideas of making a dress. But, succumbed when I realized the event was going to be in early December, not mid January. I had a vintage dress in mind, but it kind of came down to just not having the ‘right’ material. I wanted a 4 ply silk and it’s just not in the budget. It’s an odd feeling because I am *so* used to making fancy dresses! I look forward to every bit of the process. 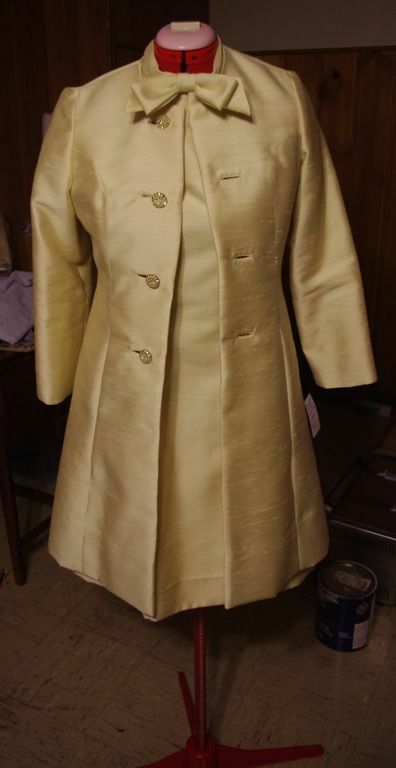 You get to sew something you normally wouldn’t wear and you have a dress no one else has. But, it wasn’t in the cards this year. I also suspect I’ll be asked all night if I made my dress and will have to hang my head in shame when I say, ‘no’. So, I found this dress at Neiman Marcus Last Call. It’s a beautiful navy and a gorgeous, thick silk. It was originally $540 and I paid $120. Mine is longer than the model’s. Err, rather, I am shorter than the model. I may take it up an inch or two. That doesn’t mean I won’t be sewing *anything*. The actual swearing in will be outside. In December. For two hours. Brrrr. I do have a good winter coat and shearling boots. But, I need a warm outfit too that can transition into a reception following. Oh, and before you ask me about shoes. I, um, don’t have any. I’ll make my mom go looking with me in Florida this weekend. I think she actually likes shopping. But, I’m open to suggestions on Zappos for under $100. Ideally, $50. But, beggars can’t be choosers. I’m an 8.5 wide or a 9 in a pinch. Thanks in advance, LOL! 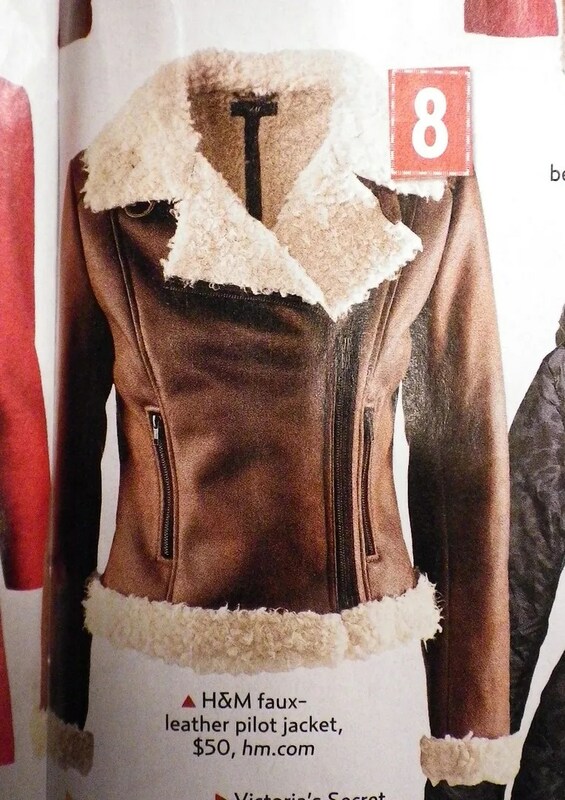 I’m still waiting for the Burda Easy Fashion with the shearling bomber jacket pattern to make its way to me from Oh, Canada! 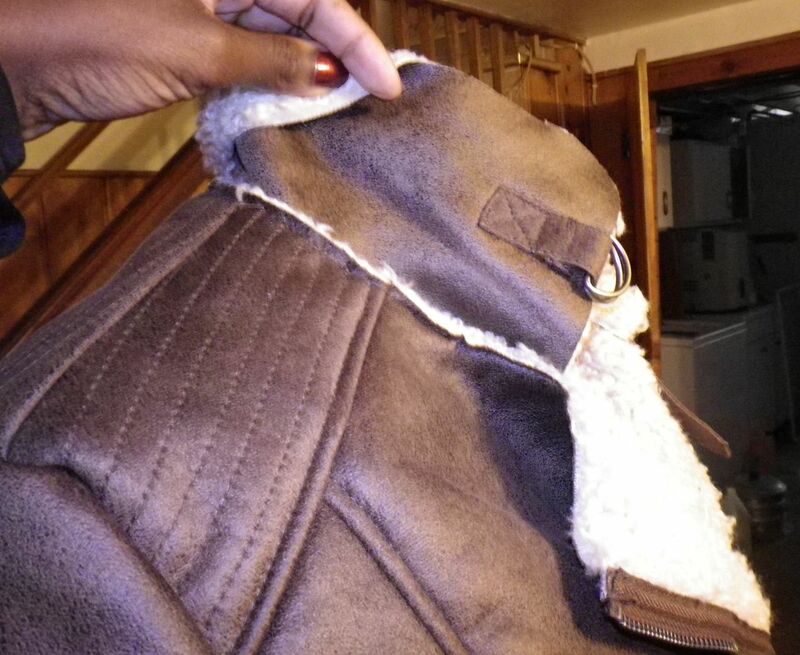 I have this gray and black shearling from FabricMart for it. 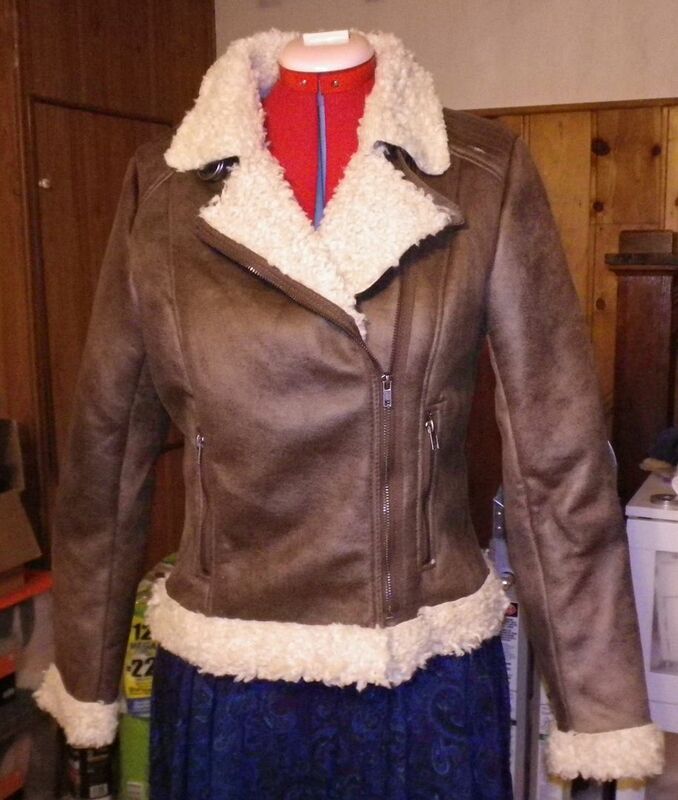 I think I will not have enough skins to make the jacket happen. But, I definitely have enough for a vest. I wanted the pattern to come before I left town for Florida / Thanksgiving with my parents. I was going to lay it all out and see if I had enough material. 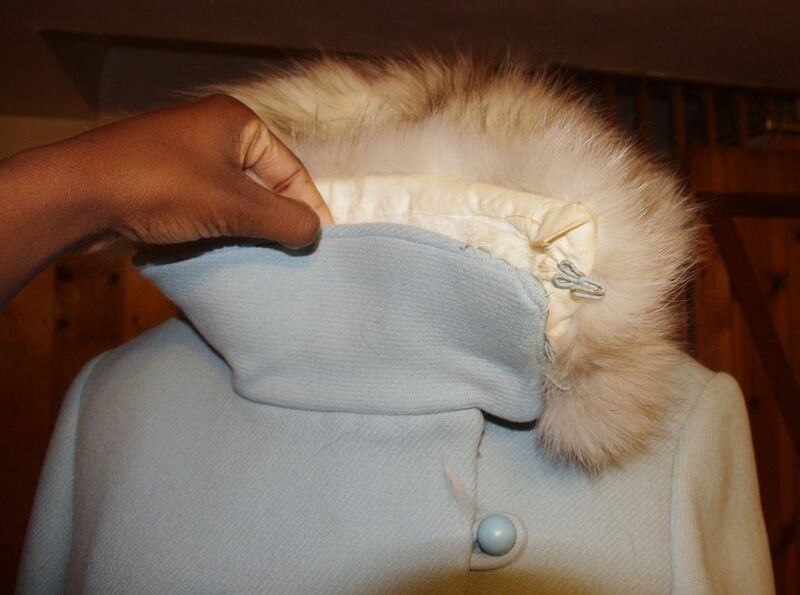 I’m so obsessed with this idea that I won’t be able to think of much other sewing until. If I did come before I leave (Wed. night), I figured I could cut it at my parent’s place and leave my mom to contend with all the bits of cut fur / wool…. But, it’s not here yet. You see, I bought it three weeks ago but at $50 I wasn’t sure it was ‘worth’ it. Not because I’m cheap. 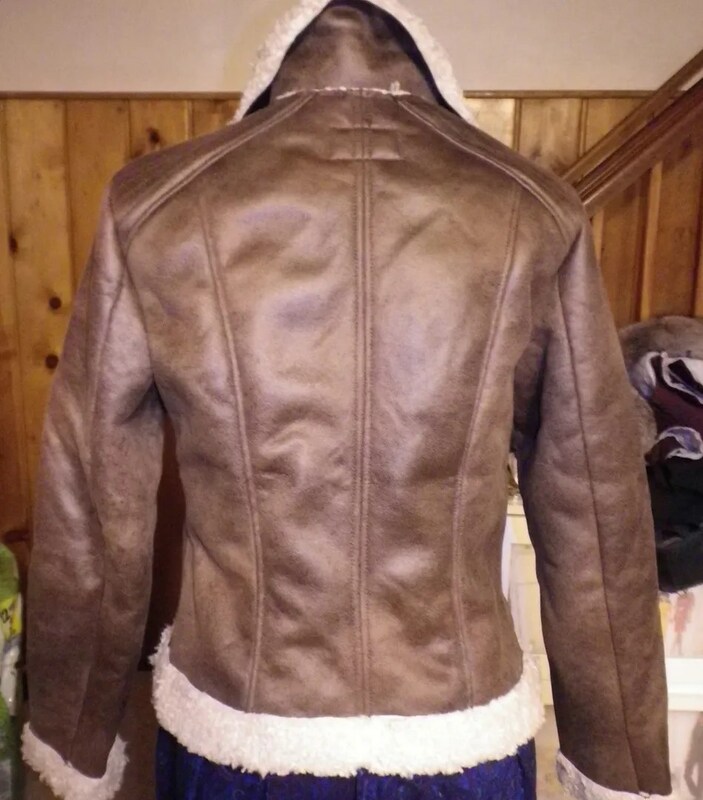 But, because I knew on a good sale I could get enough ‘real’ shearling to make this up. So, it’s been in a bag in my living room while I decided if I was going to keep it. I really liked how it was sewn and wanted to keep it around for construction technique. But, after having my taste validated in a gossip magazine, I’ve decided to keep it. It’s super cute. And warmer than you would think. Warmer, but *not* breathable. I’ll need to look out for the next FabricMart shipment of shearling. Actually, I’m pretty sure when they get it again I’ll finally just roadtrip out to PA to purchase. Then, I can make sure I have enough material. It appears I’m on a bit of a vintage kick! 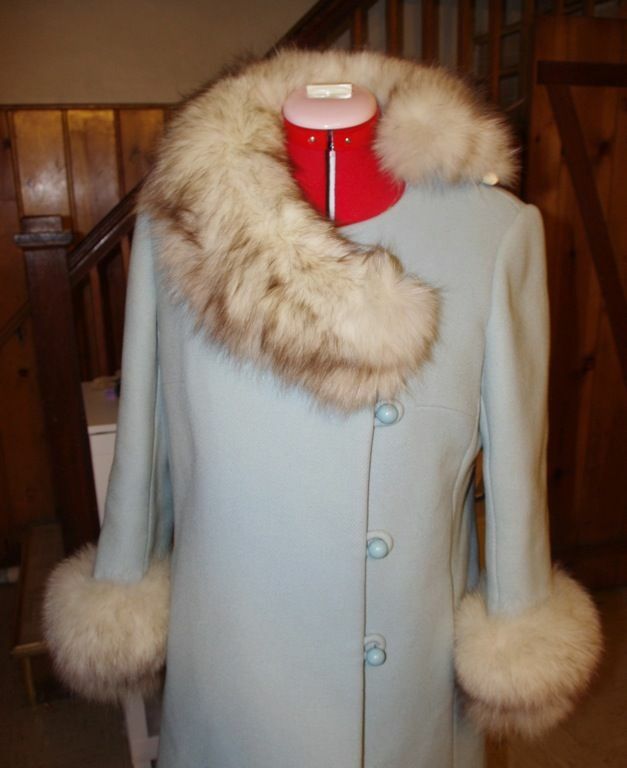 I stopped by my favorite vintage store today and scored a gorgeous pastel blue wool coat. We were on a Civil War History Bike Ride and the store was across the street from the starting point. How convenient! 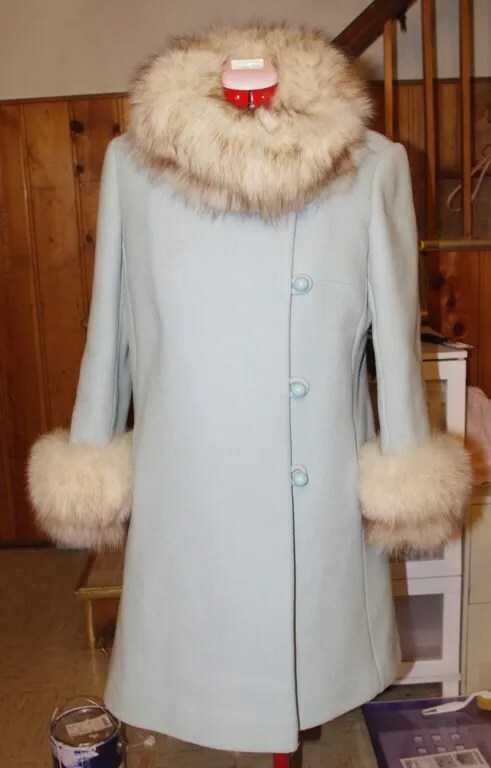 I was thinking about a fancier coat for special events. This fits the bill perfectly! 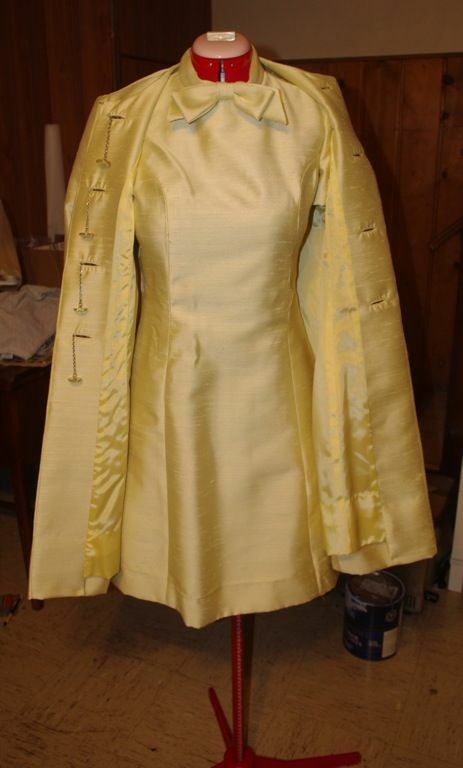 It was so much fun showing you the construction of my yellow vintage dress that I thought I might do the same here. 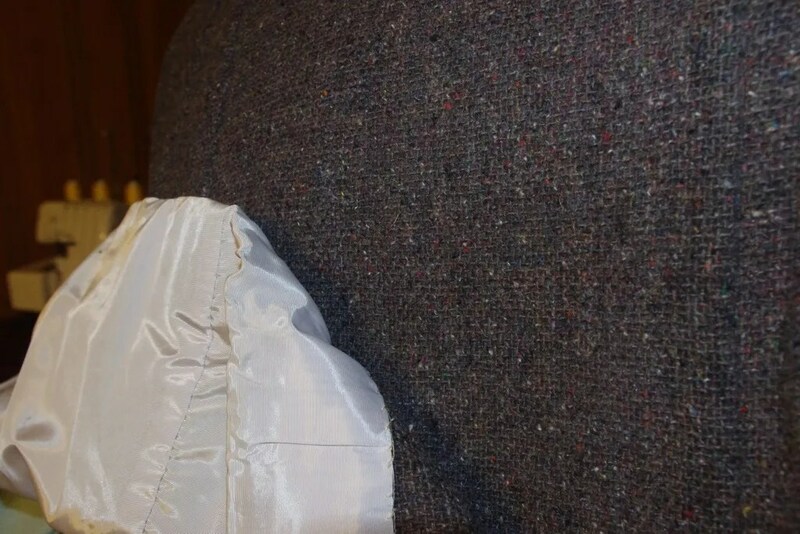 This time, I took photos in the coat 🙂 The first thing I noticed is the coat is fully interfaced, with more interfacing under the arms. 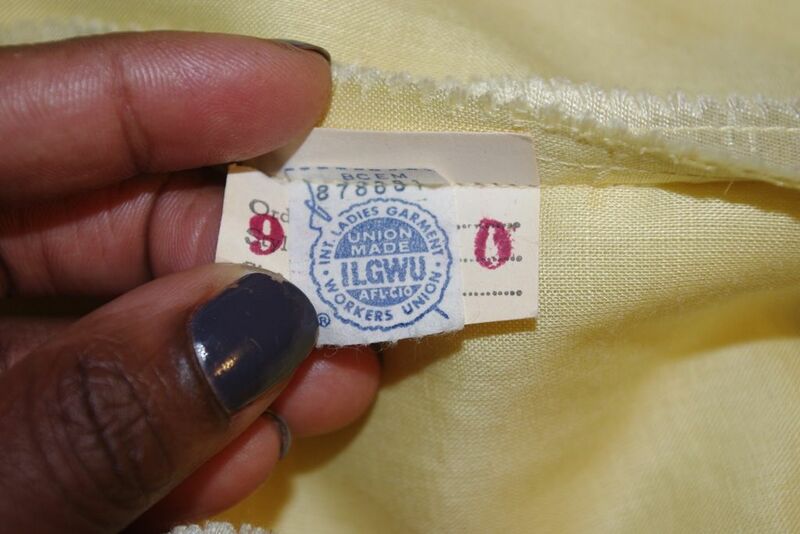 While inspecting the coat, I also noticed that it was underlined too with more wool! 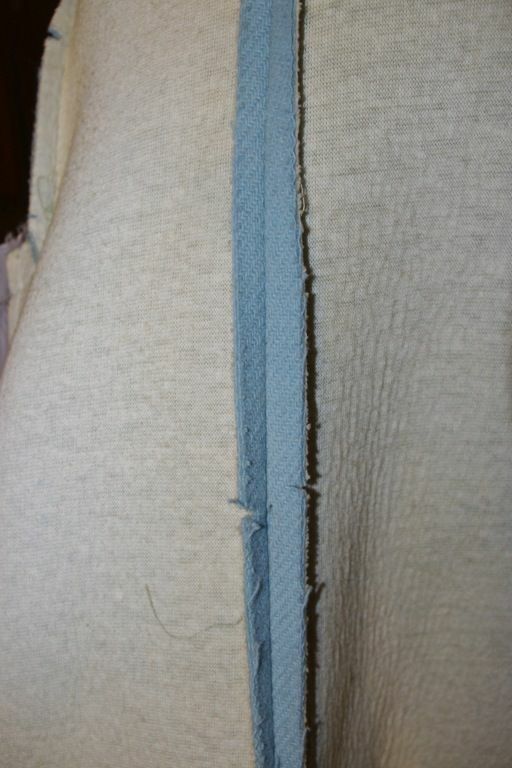 The seams inside are narrow, about 1/2 inch or less. They are left unfinished. The lining actually feels kind of acetate. Thick acetate. But, acetate. I’m debating removing the fur myself and sending it to the drycleaner and reattaching the fur after it comes back. Perhaps even add snaps so that it’s easily removable. Or, should I send the entire thing to a furrier? My fox fur and leather hat cost a MINT to clean. 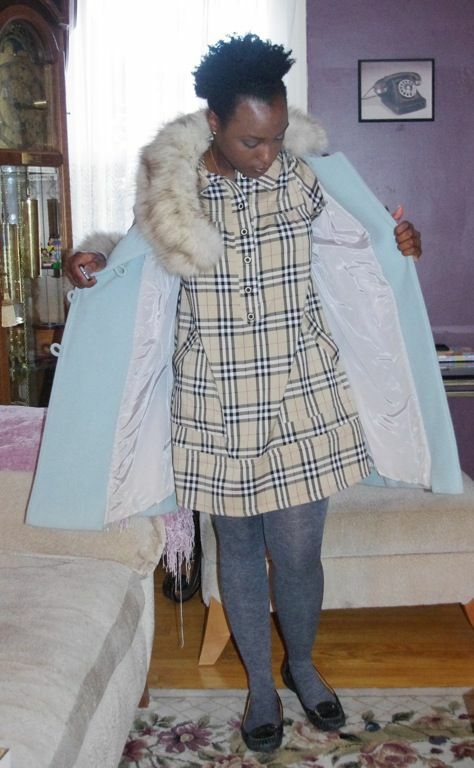 More than I paid for this coat. 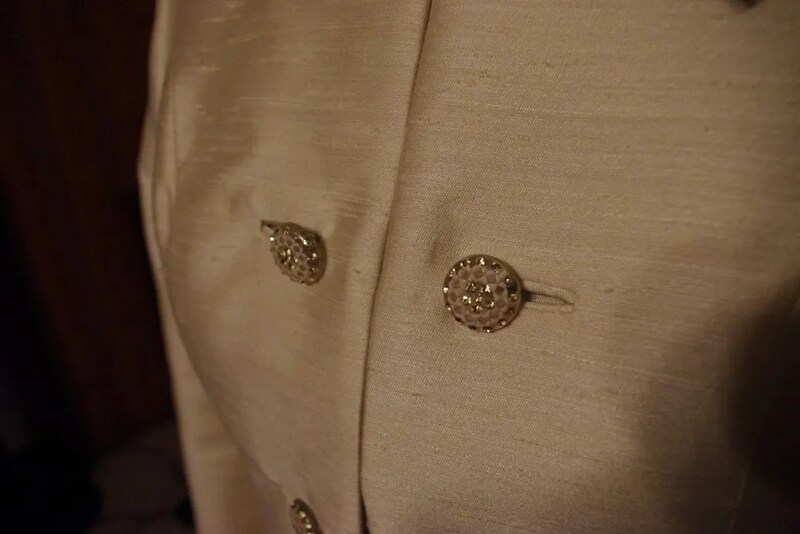 But, I bargained the price of the coat down because of cleaning costs. It’s pretty dingy with some stains on the back. The shoulders are brownish / dingy in parts too. If not for all the interior structure, I would soak it in the tub at home myself. Oh, an anyone seen looooong cream or gray gloves for sale? Thoughts on cleaning? Anyone? Bueller? Bueller? It’s day SIX of TEN for voting for the Mobbie Awards! Thanks to your dedication, I’m still in the mix for the top prize of BEST OVERALL BLOG!!! Do you mind going in and voting again today? Remember, you can vote every day until the bitter end. The weekend is a great time to vote as points are cumulative. I’m hoping my fellow nominees have shame and don’t bug their readers, friends and families to vote today too. And after you cast your votes, you have an opportunity to vote for me in Best Overall Blog. I’m getting closer and closer to calling myself an AWARD WINNING BLOGGER!! I’m attending a wedding in Atlanta at the end of the month and needed a dress to wear. I had every intention of making one, but stumbled upon this gem at a vintage store in town. The price was too good to pass up. And, the color looks pretty awesome on me. My friend Liz thinks this era suits me because of my build. It would suit me better if my arms weren’t as muscular! I find that these clothes fit me well in the torso, but are awful on any part of my body that has muscle tone. It’s not a perfect fit. 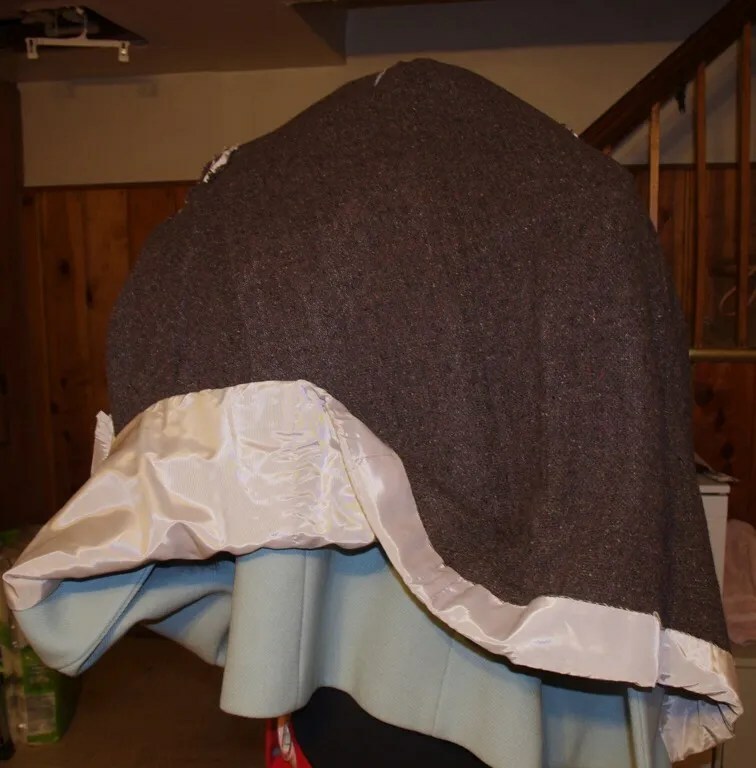 The bust is pretty snug and the back is tight. But, I was happy to discover the dress had been taken in at some point. So, I was able to get about 3/8 of an inch extra in the bust. The yellow is a poly blend of some sort and I honestly think it’s never been worn! 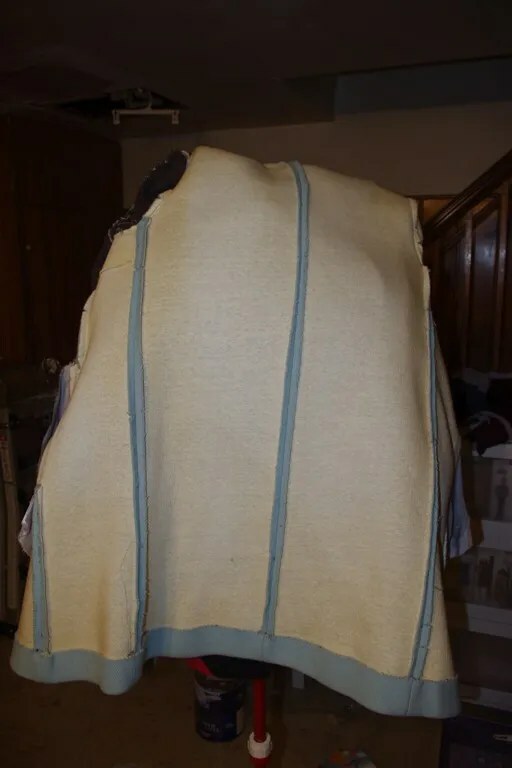 For its age, there are no body stains, no worn spots, no sign of wear whatsoever. Honestly, I found myself pressing the seams open and flat! I wanted to post this dress because the construction is beyond belief. The entire dress is underlined with organza. It could stand on its own it’s so structured! 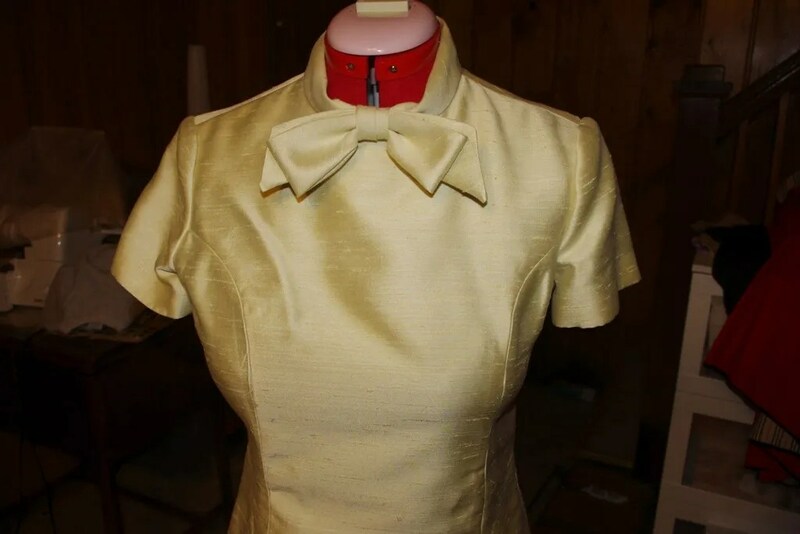 While the dress is underlined, there is no lining. The seams are finished with pinking and a straight stitch. 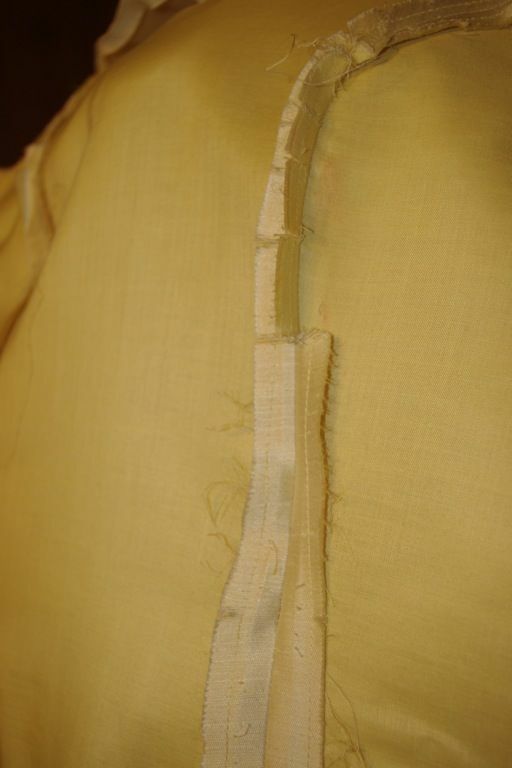 Luckily, I have yellow on the serger and finished as many seams as I could. 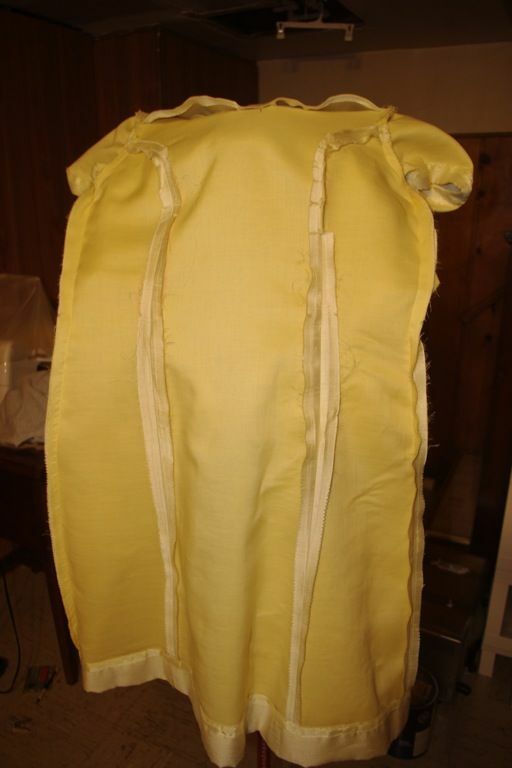 The back uses a metal, lapped zipper application. 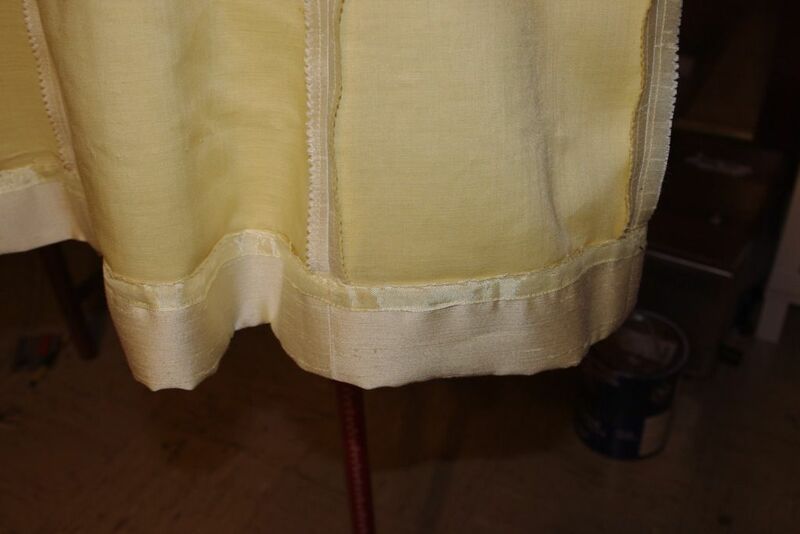 There is a wonderful deep hem which keeps it nicely formed and gives me room to play with the length. 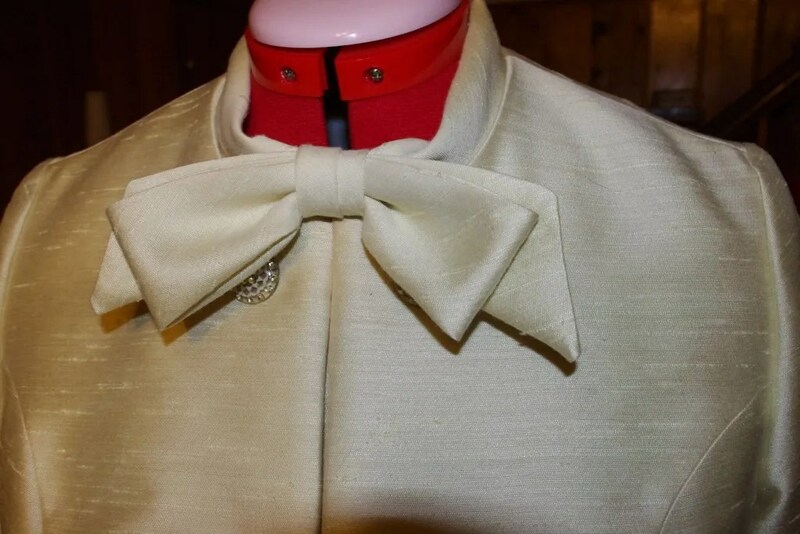 I LOVE the bow right at the top and how it peeks through with the jacket. Yes, there is a matching coat. It’s stunning. Stunning! It has the same princess seams as the dress. The bound buttonholes are nicely tailored and look amazing with the buttons / chain. The jacket is lined with a matching yellow. It too has a deep hem. I’m thrilled! I can’t wait to wear it at the end of the month. I’m pretty fascinated by the sponsorships / merchandising deals that designers take on. A friend who is a publicist in New York says fashion shows are incredibly expensive and can only be done with sponsorships. So, when you see that Clairol is doing hair and Loreal is doing makeup, you know who paid to put on the show. Another extension of that is nail polish. While I haven’t been taking photos of swatches and posting them as much (turns out my nails hate acetone. Am growing them out again), I’m still entrenched in my nail polish addiction. 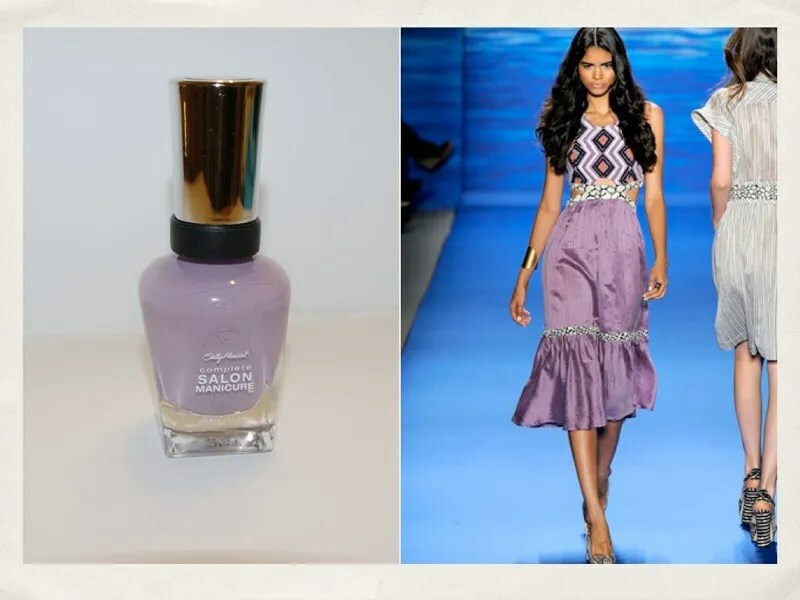 While most of us love the Tracy Reese for Vogue patterns, not everyone in the sewing community knows that she has also partnered with Sally Hansen. This drugstore line collaborated with Tracy Reese and Prabal Grung for the Spring / Summer 2011 collection. You’ll notice in the store that the collection is not specifically marked ‘designer’ or ‘Tracy Reese’. There doesn’t seem to be the big ‘launch’ such as Issac Mizrahi at Target or Hello Kitty at MAC. Last week they were buy one get one free (BOGO) at Rite Aid drugstores. Below, I’ve paired the colors to reflect the inspiration from her Spring and Pre-Fall 2011 collections (runway photos are from Style.com). 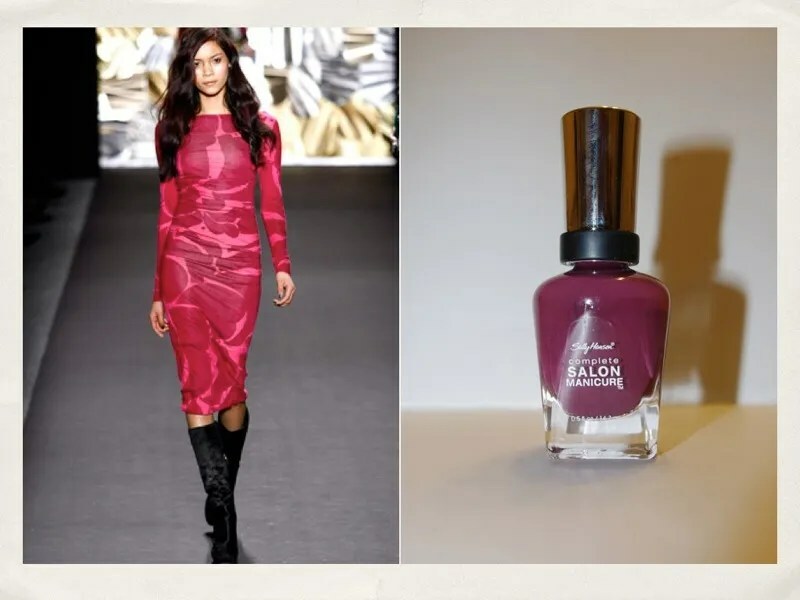 This is actually the tenth year that Tracy Reese has collaborated with Sally Hansen. You didn’t expect me to say ‘no’ to a pastel pink, did you? First Kiss. Last up is Summer Plum. It seems pretty deep and vampy for a ‘summer’ color. But, I loved the rich tones. As I noted, I left two shades out a gray and coral. I liked the gray I saw. But, I have several grays that were close enough. And, as I have mentioned before, I personally hate coral. So, there you have it. 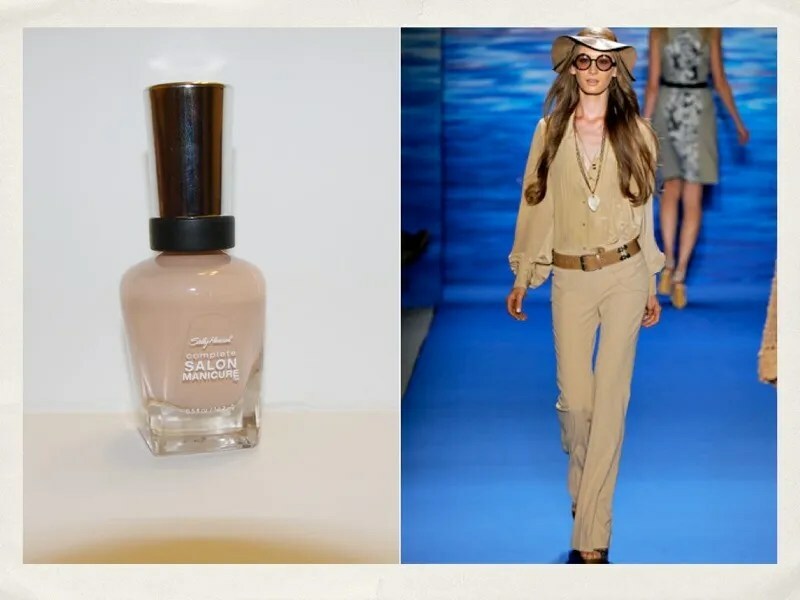 How fashion is influencing your nail polish choices!